The advancement of digital science thrives on the timely sharing and accessibility of digital data, and every day research activities provide unlimited amounts of data that could have an impact on achieving the objectives of a number of seamless research processes and their quality. With all the information and data available, it is important that your data are valuable, properly described and managed. By taking care of these matters at an early stage, your research will stand out and foster new promising integrative scientific approaches and studies based on FAIR Data. FAIR Data Principles (Findable, Accessible, Interoperable, Reusable) aim to help you create, share and re-use quality, valuable, and responsible data. Only by leveraging and applying the evidence about FAIR data impact we can help data live up to its long-term potential. The FAIR Guiding Principles for scientific data management and stewardship - Nature article (2016) launched the FAIR concept. "Throughout the Principles, we use the phrase ‘(meta)data’ in cases where the Principle should be applied to both metadata and data”. Metadata – or ‘data about data’ – is arguably one of the most powerful tools available in scholarly communications. Good metadata enables discoverability and access, and (potentially) eliminates errors. Interoperable metadata linkages and promoting data citations could provide an efficient model or a framework enabling access, management and re-use of any Digital Object (D.O.) – for example, a data set or journal paper - in a long-term. ... sufficiently rich metadata and a unique and persistent identifier using a standardized communications protocol. ... metadata understandable to humans and machines. This metadata is registered or indexed in a searchable resource and deposited in a trusted repository. (Meta)data should be supported by open, free, and universally implementable protocols which allow for an authentication and authorization procedure, where necessary. [check the FAO LODE-BD: encoding strategies for producing meaningful Linked Open Data (LOD)-enabled bibliographical data]. [check: FAIRsharing, AgriSemantic Map of standards, Basel Register of Thesauri, Ontologies & Classifications]. (Meta)data includes qualified references to other (meta)data. ... metadata with clear usage licenses and provide accurate information on provenance. (Meta)data is richly described with a plurality of accurate and relevant attributes, and meets domain-relevant community standards. 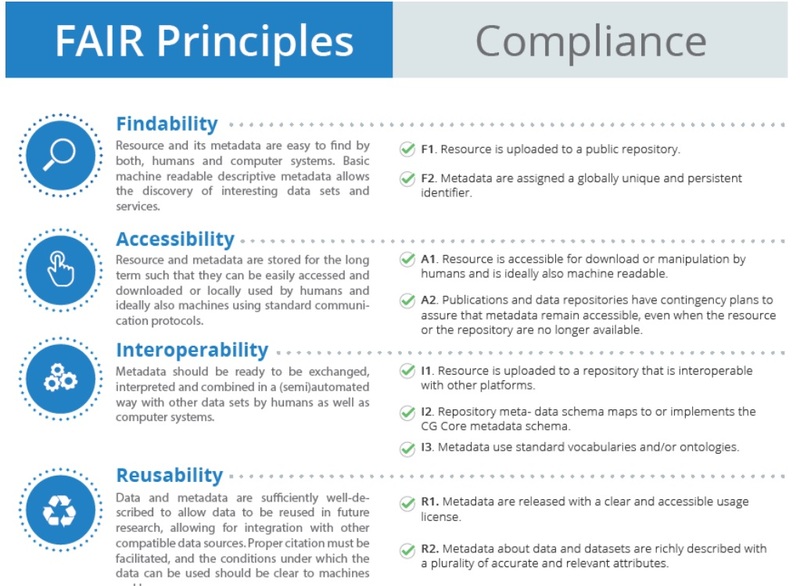 Machine-actionable metadata (supported by Machine-actionable Data Management Plans) are core to the FAIR Principles. GO FAIR and RDA (Research Data Alliance) members have launched the 'Metadata for Machines' workshop series (M4M) to assess the state of metadata practices in data-related communities and stimulate the creation and re-use of FAIR metadata standards and machine-ready metadata templates (definitions of metadata categories). Collectively, the M4M series of workshops result in recommendations about metadata and an Open repository of machine-ready, easy to use and interoperable FAIR metadata templates and components. Anyone can access this ’sea’ of metadata templates/components, re-use them as they see fit, and deploy them using metadata editors and other data capture tools (Learn more from: GO FAIR, Making it easy for humans to make metadata for machines). HOW TO MAKE DATA BE(COME) FAIR TOGETHER? Discover RDA IGAD ‘Landscaping the Use of Semantics to Enhance the Interoperability of Agricultural Data' … and keep coping with FAIRifying challenge! pushes 'increasingly speaking with one voice' (check, e.g. GO FAIR Implementation Networks). Put FAIR principles into practice and enjoy your data! FAIR data: What and Why? Easier said than implemented? METADATA 2020 : details and crosswalks of the recommendations. Can we agree? Big Data: unlocking the future for Agriculture! You are invited to Sign up for AIMS News, follow @AIMS_Community on Twitter... And, thanks again for your interest!